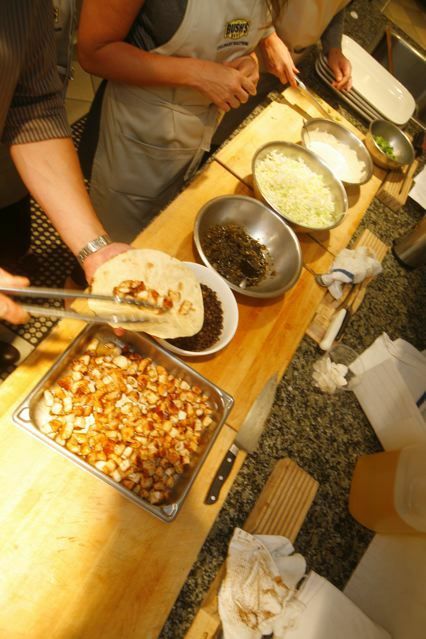 GIVEAWAY & THANKSGIVING EVE: JEFFREY SAAD’S BUSH’S BEANS SEARED SCALLOP TACOS! I want to share with you a wonderful, healthy recipe that I think is perfect for your Thanksgiving Eve meal. 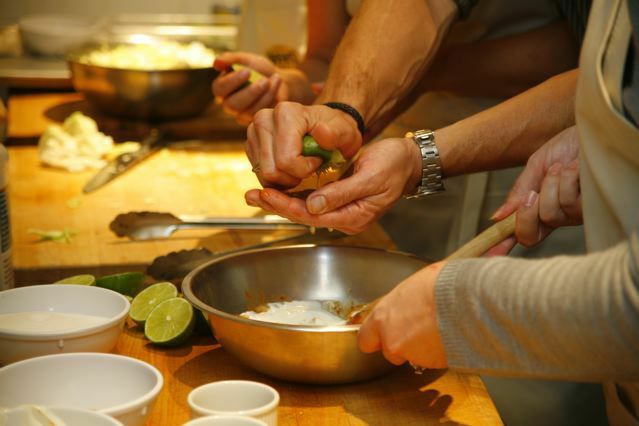 If you’re entertaining, or maybe just hanging with your immediate family, it’s light, flavorful, and fun for everyone to be in the kitchen together! My son will be home from college and we’re so excited. Of course he loves his Mama’s cooking and will be ready to eat “anything,” but it will be wonderful to have our family all together for a meal. But first of all, there’s not only a yummy recipe to try out, but a GIVEAWAY today, too. Tell about if you have out-of-town company coming in this week, or if you plan to cook a big meal on Wednesday night, too? Or, what is your TG Eve tradition in your home? Giveaway begins right now, today, Monday, November 22, 2010, and ends, TG EVE Wednesday, November 24, 2010 Midnight PST. Winner will be announced sometime on Friday, November 26, 2010. Now for the tasty recipe for your TG Eve meal! A few weeks, back at the CIA in Napa Valley with Bush’s Beans, I was honored to cook next to Jeffrey Saad, Culinary Entrepreneur and Host of “United Tastes of America” for the Cooking Channel. And I gleaned many helpful tips! Kristen (Dine and Dish), Laura (Real Mom Kitchen), Cheryl (Tidy Mom) and I had a blast together cooking with Jeffrey. 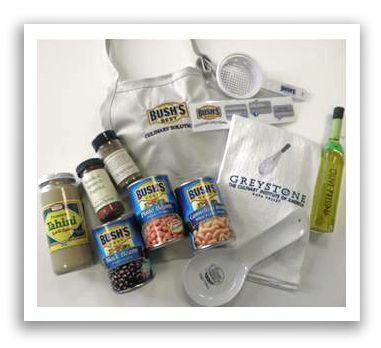 Created for BUSH’S® Beans by Jeffrey Saad, Chef, Culinary Entrepreneur and Host of “United Tastes of America” for the Cooking Channel. 1. For Scallop Tacos: Blacken Anaheim chiles over an open flame (holding chiles with tongs) or broiler. 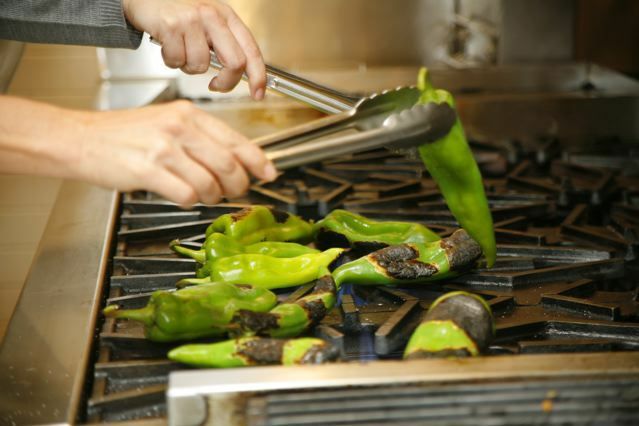 Place chiles in small bowl and cover with aluminum foil to allow skin to steam loose. After 10 minutes, wipe off skin with fingers. Seed and chop into ½” pieces. 2. Pat scallops dry and remove rubbery lip from side of each scallop. Season with salt and pepper. 3. Add oil to medium sauté pan over medium high heat. 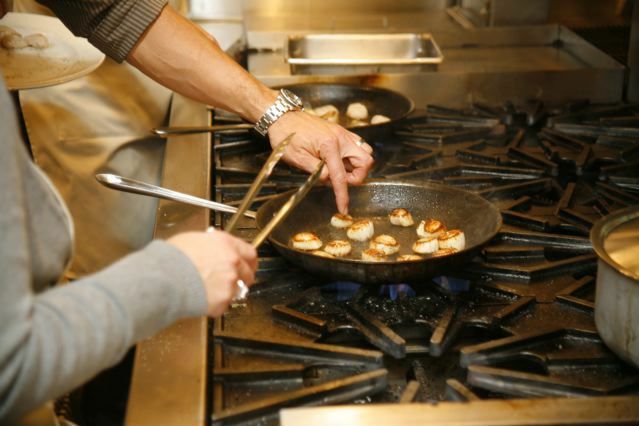 Once oil is hot (you see a haze coming off the oil), add scallops to pan. Sear until you have a nice golden crust. Flip scallops over and continue cooking until you see the side of the scallop go from translucent to opaque. Remove from pan and set aside. 4. For Black Bean Puree: Add garlic to the same sauté pan. Stir briefly just to soften, then add beans, chicken broth and paprika. Turn to low and cook 5 minutes. Set aside to cool. Once cool, puree mixture in food processor and set aside. 5. For Green Chile Chutney: In a medium size skillet (non-stick is ideal) over medium high heat add cumin and oregano. Toast for 1 minute, just until you can smell the cumin and oregano. Immediately add vinegar, (don’t breathe in as the vapor of the vinegar rises) sugar and salt. Bring to a boil. Add Anaheim chiles and jalapenos and simmer until a thick sauce consistency (about 8 minutes). The chutney will thicken as it cools, so stop cooking when the chutney is still saucy (easily flows from side to side as you tilt the pan). Using a rubber spatula, move chutney into a small bowl and let cool. The remaining chutney will last for three weeks in the refrigerator. 6. For Chipotle Chile Sour Cream: Puree chipotle peppers in adobo sauce in a blender or food processor. In a medium bow, mix together 1 teaspoon of chipotle puree, sour cream and salt. Squeeze in lime juice and mix well. 7. 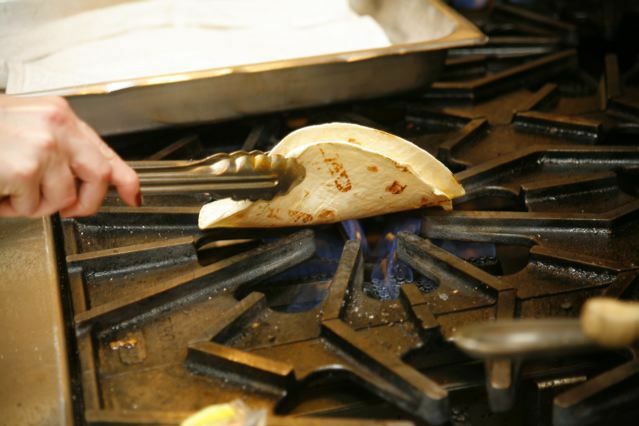 Toast tortillas over an open flame (using tongs), in a non-stick pan or under the broiler, and lay on plate. 8. Place three tablespoons of black bean puree across each tortilla. 9. Cut the scallops into rough ½” pieces and lay on tortilla. 10. Top with the chutney, cabbage and chipotle chile sour cream mixture and serve. 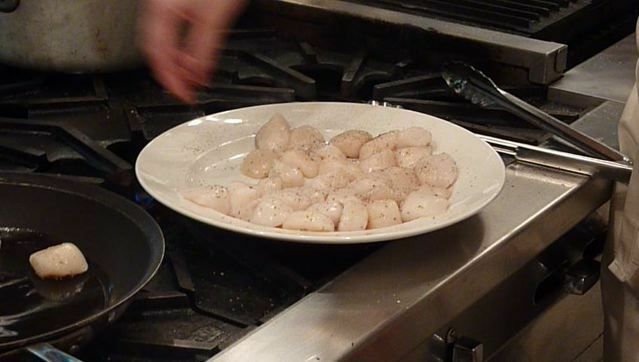 • The scallops will continue to cook when you remove them from the pan due to the residual heat. Err on the side of taking the scallops out early versus over-cooking them. • Don’t let the cumin and oregano burn. Have the vinegar ready when you add cumin and oregano to pan. 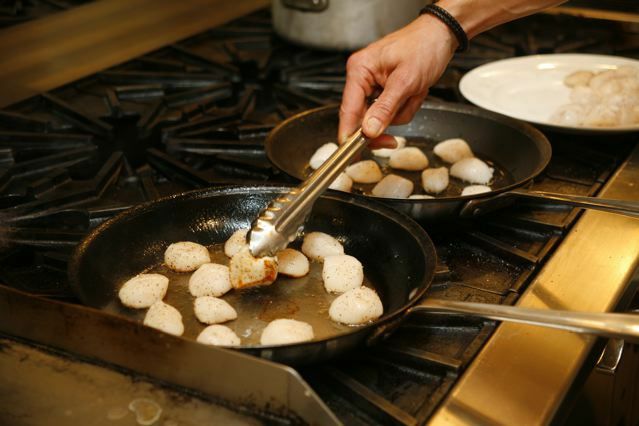 Let them toast for just 1 minute (your pan will be very hot from the scallops you seared) and then add vinegar right away. • Add sliced avocado for a creamy addition. • Corn tortillas are more traditional and hearty, with a fuller flavor. • Flour tortillas are easier to handle, softer and chewier. • Shrimp works great as well.